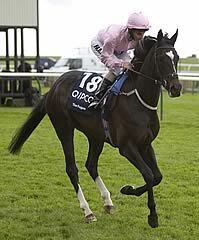 The Fugue struck a blow for the fillies with an emphatic victory in the Red Mills Irish Champion Stakes at Leopardstown. John Gosden's charge shrugged off concerns about the ground when outpointing her rivals. The field came down the centre of the track in the straight as William Buick made his challenge to the front-running Trading Leather. Al Kazeem tried to haul back Lord Lloyd-Webber's four-year-old but to no avail as The Fugue (4-1) prevailed by a length and a quarter. Trading Leather was third. Buick told At The Races: "I was worried about the ground, but it worked out well. She's one of the greats now. She's been so unlucky and should have won so many times last year. I'm just glad she's getting the rub of the green. "She's always been special and has always been a special one in the yard for everybody. She's very good and has arguably beaten the best around at the moment. She's beaten the colts in a championship race and it was a great performance the way she did it." Gosden said: "We walked the track twice before racing and I'm glad we decided to run now. There's a sense of relief. The ground yesterday would have been perfect but luckily the heavy rain has only really started now. If we'd got that three hours before racing, we wouldn't be standing here now. "After coming over, I wasn't inclined to go back to England and then cross the Channel for the Prix Vermeille next week." The Fugue had finished behind Al Kazeem at Royal Ascot and when thoroughly disappointing in the Eclipse at Sandown, and Gosden was delighted to see her reverse that form. "It was a proper race. The first three went a solid gallop - Kevin (Manning on Trading Leather) didn't mess around. It was a proper, even test and she came through well. I'm really thrilled. There's some good, solid form lines there with Trading Leather and Al Kazeem. The ground was just on the easy side of good, it was never soft," he said. "William said he could have gone sooner, but he wasn't sure how she would pick up on the ground. I'm thrilled with her. She's still really fresh at this time of year." Gosden will now consider the options for his star filly, with another trip to the Breeders' Cup meeting, where she finished an unlucky third last year, a possibility. "She is in the Arc. Sometimes you can get fast ground there. I think it was like that when Sea The Stars won, but last year it was bottomless. It gets a little specialist on bottomless ground. She's in the Prix de l'Opera and if she doesn't run over the Arc weekend, it would be the Breeders Cup again." There was disappointment as the Aidan O'Brien-trained Kingsbarns was eased off by Joseph O'Brien in his belated first race of the season. O'Brien had withdrawn his other declared runner Declaration Of War because of the rain-softened going. O'Brien jnr said of Kingsbarns: "When he met the road, he took a bit of a bad step and lost his action. He wasn't too bad pulling up and hopefully he's just given himself a little bit of a bang."